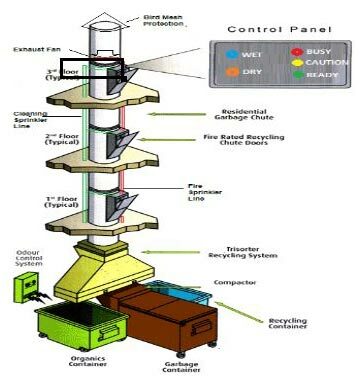 KleanChute Garbage & Linen Chutes (Garbage Chutes) are a superior effortless and easy method of controlling and disposing of refuse and linen of high-rise buildings, hotels and hospitals. Also, Advantages of installing linen chutes is that it becomes a centralized collection point for the entire building connecting directly into the linen washing room. The addition of chute is cleaning systems, sanitizing and disinfecting units. The superior design of Chutes & functionality has significantly increased worldwide acceptance of such products. The Chutes are designed as per American and British standards to meet the firm necessities of environmental health and protection. Fully electronic CPU system, and fire sprinklers. KleanChute is particularly designed for use in high rise buildings, hotels, hospitals, condominiums, commercial complexes and shopping malls. Easy installation at any duct, lobby, staircase, kitchen, etc. where waste needs immediate controlling, moving and disposal. With KleanChutes Advanced Chute Electronic PLC systems, chute can even be controlled remotely. Automatic Opening, passcode enabled access. Lockouts for specific hours of the day, preprogrammed runs for fans, sprinklers, automatic brush system and connectivity to BMS systems are all available. Segregation Chutes which will make possible to divide DRY and WET garbage to its particular bins in two way chutes or among paper, metal, plastic in three way chutes are the need of the hour. KleanChute provides the cutting edge technology to enable user to recycle waste efficiently and cost effectively. Sangir helps its valued customers with KleanChutes right from designing stage to installation. Chute Controller PCB or PLC based Electronic control panel for complete automation. Remote IP based through internet to logging for PLC based systems reprogramming. 2 way or 3 way Segregation Chutes. Allowing waste to be segregated at user level. Sound Dampening Coats for reducing noise of falling garbage. Superior Industrial Grade Parts like Hydraulic cylinders etc. T Type handles for best grip and usage. Doors size available : 12X15", 15x15", 15X 18", 18X18", 20x20", 24x24" & Customs sizes are also available.